Freshman Raquel Cuevas is congratulated by College of Education Dean Perry Schoon at a COE scholarships ceremony in September 2014. Freshman Raquel Cuevas earned more than $20,000 in scholarships and other financial aid to attend Illinois State this year. So how did she do it? What’s her big secret to earn all that free money? It’s simple advice, but that’s how Cuevas did it. The Elmhurst native spent her senior year in high school juggling dozens of private scholarship applications, each with a unique set of requirements such as letters of recommendations and teacher surveys. But all that hard work is now literally paying off; she essentially earned a free ride this year, thanks to 10 scholarships, a grant, and other aid totaling $26,000. Cuevas hopes her story inspires other Illinois State students to apply for scholarships too, especially this fall as application season begins. IllinoisState.edu/Scholarships is a good place to start. Cuevas was the first in her family to leave home for college. 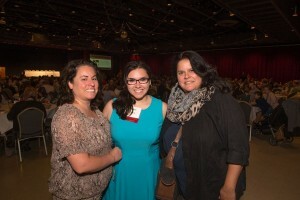 During her senior year at York Community High School, Cuevas and her mom started exploring the various private scholarships offered through her school. Soon, Cuevas was filling a notebook with all of the requirements and deadlines. Keeping track was difficult, and she had to stay on top of her teachers when letters or surveys were due. But she found some tricks too, such as re-using tweaked versions of the same essay on applications. Raquel Cuevas with her family at the College of Education scholarships ceremony in September 2014. The smallest scholarship obtained through her high school was $1,000. The largest ($4,000) is from the Doris and Everett Bernardo Family Foundation, a renewable scholarship for Hispanic students. She was the only one who applied for that scholarship—something that happened several times. “If nobody applies, nobody’s going to get it,” Cuevas said. Another piece of advice: Don’t skip an application just because it’s a smaller scholarship. That money can really add up, Cuevas says. “It’s this whole big process, but it’s easy things. They’re tedious, but they’re easy. If you have the patience for it, and you can put the time and effort into it, you end up with a lot of money for school,” she said. Cuevas is majoring in special education at Illinois State, with a double emphasis in deaf education and learning and behavior, and a minor in Spanish. At Illinois State, she earned the Evelyn J. Rex Scholarship for special education students, and was awarded a federal TEACH grant (for students in certain high-demand education majors who plan to teach in low-income communities after graduation). She’s also pursuing a tuition waiver for special ed majors, which would help pay for the rest of her education once her first-year scholarships expire. Cuevas earned so much financial aid, in fact, that she recently got a $3,000 refund from the University. All that aid has made her a familiar face in Illinois State’s Financial Aid Office. Without her scholarships, Cuevas said she probably wouldn’t be attending Illinois State. And she’s not done applying for scholarships—far from it.